It seems tiring to guess whether there will be an agreement before the end of the year. All I know is market continue to function and Dow Jones has advanced from 12500 to 13000 these 9 days. We are just 600 points away from breaking 5 year high. All I know is Yoma and Ezion will still go up after consolidation. All I know is Apple and Facebook are some of the stocks to watch this christmas season. All I know is that US tech sector, retail sector, and travelling industry are the sectors to watch these 2 months. All I know is that putting your money on buying strong earnings stocks are what makes you money. Perhaps I simply do not need to listen to every news about Fiscal Cliff. Perhaps I do not need to listen to Republicans or Democrats debating about it. Maybe I should just do what I do everyday, which is to stick to my strategy that has all along work for Me. If you think you are confused by all these talk about whether there will be a resolution, yes, no, or maybe before christmas, you may want to shut your ears to it and stick to what makes you money. By the way, just for your info, the market actually went up 1500 points from june to september when we are also debating about whether there will be QE3. Yes, no or maybe.... so so confusing. Do remember ur money management! All these stocks have strong sales/ earnings or strong forward earnings expectation to sustain their run. All can be our focus this quarter. Not for contra trading. If it does not go according to what we want, do prepared to hold. The good thing is that these stocks can hold a while because of fundamental story. I believe his words. I think so should you. Each time the market drops a bit, I feel that it is good to accumulate some stocks. I know it seems confusing that everyday there seems to be some politicians positive and negative about it. Forget about the confusion. Just know that the deal will be out before year end. If you dont buy stocks at any drop, I am afraid there might not be much chance after the deal is out. Today Dow at mid day increases 50 points from 100 points down because of Obama's words that he would like to have a deal by Christmas. This positive statements from Obama will continue throughout these 3 weeks till Christmas. Accumulate slowly but do control your position size. Look for stocks that did well in their earnings this quarter. Look at SUPERGROUP. We mentioned that this is a stock with a good earnings story where you need to keep inside your portfolio this quarter. See how they run to $3.30 today. Do not forget Ezion and Yoma too! Although they may be resting now, there is a chance for accumulation to be done and to burst forward still. Of course, the thing is you need to know whether there is accumulation. Somehow or rather, I believe President Obama will get what he wants no matter what. From his first presidential election, no matter whether is it the Obama care or the debt ceiling, he hasn't really disappoint us. Let us give him a chance to prove himself again. I am sure he will! Let us rock and roll to Christmas! 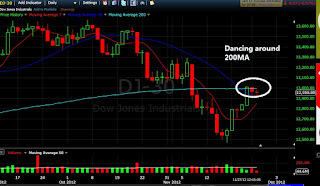 We always like to analyse the dancing movement of DOW during the day to gauge the sentiment of the US market. As an example yesterday, Dow decreased at one point to 100 points to end 40 points down. 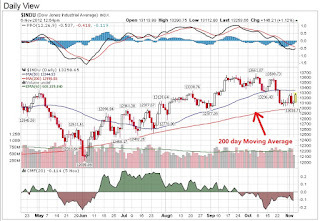 One major reason is now the index is at the 200day MA (around 13000), which is a resistance. A good sign that this market cant drop much is when every drop is met with a buy up. This is what happened yesterday. Today, the DOW went down 40 points and ended in positive territory also in mid-day. Although it is best to see how the movement is only when the market close, but this comeback in mid-day is still a sign of bullishness in the market. We would think that DOW is just buying its time to wait for the chance to break 13000 with a GANGNAM Style horse dance. :) Perhaps it might happen soon. Let us monitor. The market just need a piece of good news to light up the horse. Perhaps it may be the jobless claims this thursday or the Chicago PMI (a report on manufacturing) this Friday or whatever. We just need some spark. 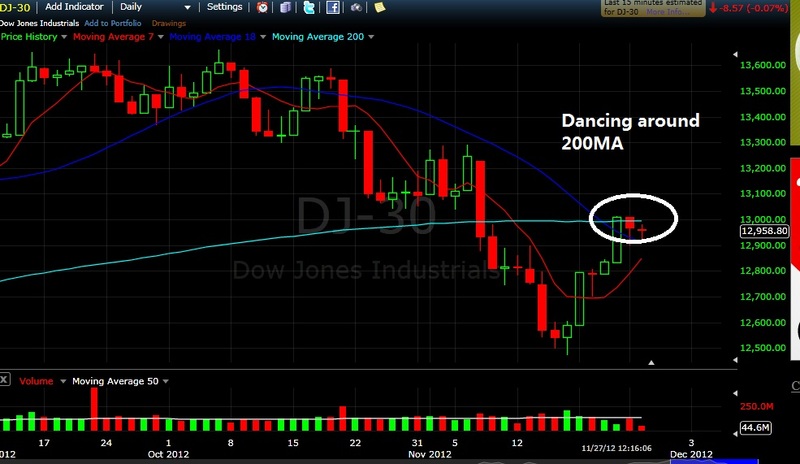 Let us see how the DOW dance around round the 200day MA. The longer it sticks to the MA without dropping, the more powerful and likely it will break. Although market may be slightly bullish now, do note that next week is a JAM PACKED week filled with economical reports. My only concern would be the jobs reports that happen on Friday. I would have to do an analysis this weekend to know if there is a danger of missing the expectations. Today Dow dropped 100 points during mid day. However Apple brings Nasdaq positive now with a 16 points upward move. With the positive move by Apple, my immediate target is for it to reach 600 soon. 597 is my short term target. Now it is at 587. Like what I said in previous articles, when Apple is on a roll, so is America stock market. And with holiday season coming up, it is on a roll. Monday is normally a day where by market makers try to go opposite to previous week movement. As last week is a fantastic up week, it is always normal that market makers will issue some bad news and concern about the market so that retailers sell. That is how they maintain liquidity, meaning create same number of buyers and sellers. Marketwatch headline in pre-market open says market is concerned with Fiscal Cliff and Europe. Bull**** headline! These are just ways market makers do to try to dampen the bullish sentiment of the market, amid the good retail sales last Thanksgiving holiday and the good performance last week. Do not be surprised that 2moro or the day after, this market suddenly bounce back up. When market makers sense the bullishness in the market, they will join in the fun to long after today's decline. Then after the run-up in mid week, Friday is often profit taking time. Of course, some of the above mentioned are based on assumptions. 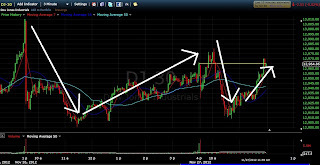 But I have seen market makers do it again and again.With NYSE TRIN index at 1.33 today (above 1 represent bearishness and I normally use it as a contrarian indicator ), there is a good chance that Dow 2moro might be an up day. Meaning Apple can have more chance on the upside 2moro! Who says we are falling over the cliff??? Not Americans! If you have been bearish going into the end of the year, worrying about the fiscal cliff and the stock market, you probably got to think again. Americans once again shows its retailing strength by buying up things and holidaying. A record 247 million Americans shopped on foot and online during the four-day holiday weekend, up 9% from the same period last year, when 226 million made holiday purchases. A total of 89 million Americans shopped online and in brick-and-mortar stores on Black Friday, up from 86 million in 2011, according to the survey conducted by BIGinsight for the NRF. More than 35 million Americans visited retail stores and websites Thursday, up from 29 million last year, the survey found, with the average holiday shopper spending $423 this weekend versus $398 last year, a rise of 6%. Do not worry about the fiscal cliff, in fact take the opportunities of the fiscal cliff drop as a chance to make some money for christmas shopping and holiday! 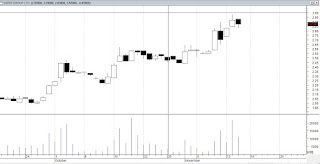 We did say that Yoma hit our target at $0.70 and our advise is to exit at that price or when it cannot stand above $0.67. It went according to plan as today you can see it drop a bit and close at $0.66. But, having said that, we also know that Yoma is a good company with a story behind. Today, I saw that though it drop a bit, (although we exited position), we saw that professional money may still be in the stock. We are still monitoring the progress. 1) If the stock goes back up to $0.695 within 2 weeks from now, there is a high chance that he stock might breakout off $0.70. $0.695 may be a good entry point. 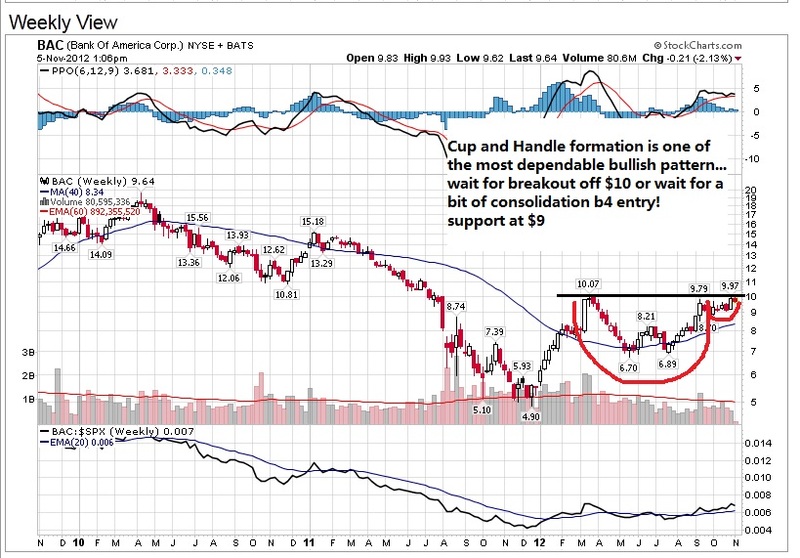 2) If the stock consolidates for more than 2 weeks, we will look at $0.71 as the entry point upon breakout or when it consolidates in a base. 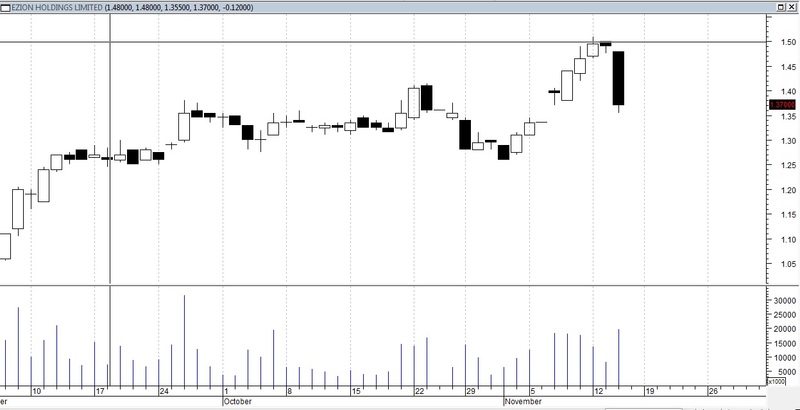 Singapore Stock Tip: Ezion going up after consolidating? I did said that $1.5 for Ezion is a resistance, but we still need to pay attention to this stock as it is a strong earnings stock. 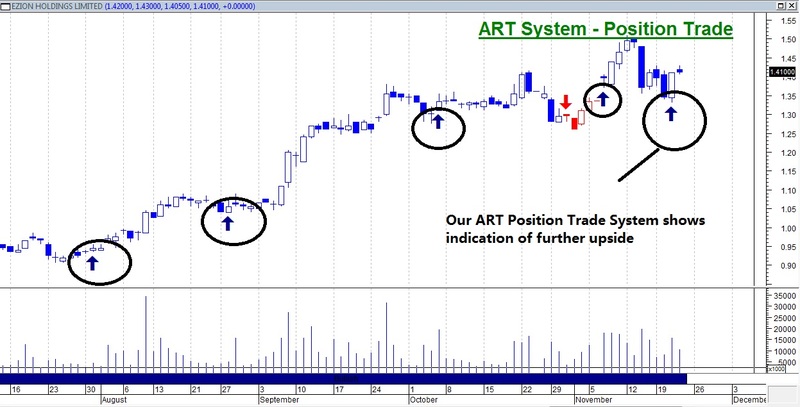 From our ART system, it shows signs that accumulation might be taking place and chances are that this stock may have further upside. It hits our target of $1.5 where we exited. Target price: $1.60, Stop loss: $1.30. If touch $1.5, put stop loss at breakeven. I would be interviewed in FM958 on Thursday live at 1.15pm by Wang Di Cong regarding the recent market about Hong Kong, China and Singapore. Do tune in to hear about that. 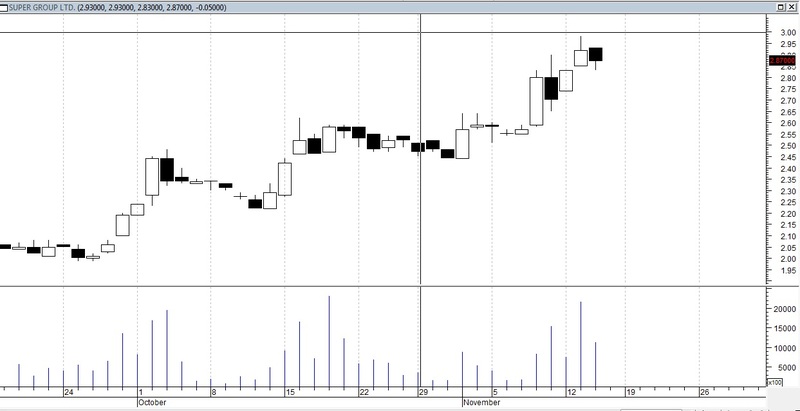 After Ezion hits our target, Yoma, a recommended stock last month, today also hit our target from 0.67-0.70! Congrats on those that followed our recommendation based on our ART system. 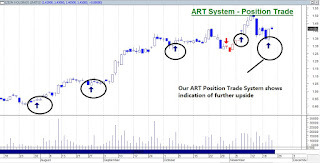 We also exited half of my position for this trade at the highest point 0.70 today. Now the stock is at 0.675. We recommended this stock last month because we see that accumulation has been taking place. Maybe these guys know there might be some good news coming up. After we went in, market weakness brought the stock down to around 0.51. As our stop loss is below 0.5 the strong psychological support, after that, it flew to our target today. You can see that 0.7 is the resistance today. We are quite right, ha. But can we enter again? Yes, when it go past 0.7 again, which is a resistance. By the way this stock has a good earnings this quarter in October. It is a good stock like Ezion or Supergroup. You can see Supergroup broker out of $3 today... a show of a good stock! Let us see 2moro if Yoma's run will continue if u haven't exited position. If it continues to fall past 0.67, our advise is to profit take first. We did mention in the last article that Apple seems to have bottomed at $505 last Friday, the significant centennial figure of $500. Today it reached $560 now in mid day, an increase of near to $30. Needless to say, Dow increase by 170 points, with Nasdaq increasing by 48 points. Our opinion is that 1.5 months back, US market drop started with Apple. Hopefully the Dow now recovers with Apple too. After iphone 5 launch, Apple has been disappointing! Dropping 23% from its peak. That marks the start of the Nasdaq and Dow Jones. Btw, it is not normal for a stock to run up every single moment like what Apple did. Now at 5am in the morning, Apple closed at highest point! Almost every single hedge fund seem to cover shorting position liao. No selling at all... Have not seen Apple does it for ages! But with this Friday- Black Friday great US sales (like Great Singapore Sales), US might be in a consumer retailing mood. Everybody seems to be geared up to buy some gifts and SHOP SHOP SHOP! One thing in their mind in buying things would be Apple products. Hopefully $505 marks the bottom of Apple, and the start of a comeback! Go my darling! Make me some $$$ this christmas! You may not want to go into the stock market only when the policy is approved. Get ready to act now by studying which stocks are good with their earnings or which stocks that are in-line with their earnings but grossly oversold these few days. If you are hesitant to go in, just study first and act later when more confidence come back into the market. I am seriously looking now at some Singapore big chip counters like Kep Corp, Semb Corp and Semb Marine, which are bashed upside down. In US, the techological stocks like Cisco, Apple and Facebook sure looks tasty too! For our options grads, remember that Cisco and Facebook has good earnings. Apple may have reached its low of centennial figure of $500 when it touched $505 on Friday. Remember that we still believe there is a good chance for a late run rally into the holiday season. Btw, this Thursday is thanksgiving holiday in America. After thanksgiving, US has a Black Friday shopping day where people will go shopping. US will then issue a sales volume to indicate whether the consumer sales are good. Last year, it was one of the best ever in history. Let us see how it is this friday! My opinion is that it shouldn't be bad as unemployment rate has dropped. If the tech sales are great, expect a revival from the tech sector, especially Apple and Amazon, with the iphone and kindle sales. Do take note that Technological, Retail and Tour-related sectors or industries are the best industries to look at for a Christmas Rally! If you want to be a good trader, you got to watch this video, where 8 newbies are selected to train to be a good trader. Learning trading is a long journey, but we hope that through our school's education, you can cut down on your time spent and mistakes made. Remember that trading is a zero sum game. Behind every losing trade, there is a winner! Make sure you are the one winning! With Financial sector turning bearish and joining the party, all major exchange (NYSE and Nasdaq) and sectors have all turned bearish. Our market sentiment indicators have been providing us with timely views of the market. Over the years, sometimes I tried to go against what our sentiment indicators tell us, and most often I was burnt (because of itchy hands). So I suggest we all pay attention to what our market sentiment says, just play along it. Try to avoid being bullish now. It is ok we just sit on the sidelines as not losing is already making money. Or try to day trade only. If you are swing trading, just sit tight and get your cash ready... once opportunity comes, we pounce back everything! Huat ah! I am looking forward to a wonderful chinese new year, ha! I went to sleep after the speech started. When I woke up today, Dow fell another 100 points. Again his speech prove to be a disappointment in the market. Probably the market expects more. As I have said, it is probably too early to expect consensus so soon. Discussions have barely started, so I do not think that any speech these few days will come to anything. Expect more volatility in the market. Every noise heard is a trigger to sell. "The selling accelerated after President Barack Obama again stressed his commitment to ending Bush-era tax cuts for the wealthiest Americans during a press conference. The president's firm stance sets the stage for a tough battle with Republicans toward compromise on the next federal budget. The release of the minutes of latest Federal Reserve policy meeting was a factor as well as the commentary showed some division among members of the central bank's open market committee about continued quantitative easing efforts in 2013." You can see that now confidence isn't in the market at all. Generally it is easier for market to drop 100 points rather than increase 100 points. It is easier for market to sell down to the close instead of closing strongly. It is easier for the market to sell on bad news rather than buy up on good news. (A good example is yesterday good CISCO report: The market is not listening to the good news much, but focusing on the disppointment). All these are indications that market confidence isn't there. Let the market falls, and we hope it does. Our first target of a DOW Jones bottom would be 12300, a 10% drop, based on our mentor, Mr Hu Li Yang's theory. Once it reach there (we aren't far now), it may be a good chance to test the water by picking up some stocks. That may be a good point of reference for a bottom. A 15% drop from the high will indicate the BEST buying opportunity. Dow continues its drop by 70 points mid day into the trading session. Market still not that good before the speech that will happen in mid day. This is the first news conference live after the election. People are tuning into the speech and hoping to hear something positive. But probably, this time round, I still think the time is early to garner some positive reversal. Let us see what he says and study what the market thinks. Let us still stay on the sidelines and wait until more confidence comes back into the market. It hasn't been pretty in America or Asia. Dow has dropped from 13661 to a low of 12756 in 1 month. A decrease by 905 points or 6.6%. Nasdaq has dropped from 3196 to a low of 2883, a decrease of 9.8%. STI has dropped from 3110 to 2883, a drop if 7.3%. KLCI has dropped from 1679 to 1636, a drop of only 2.6%. Yesterday, America again showed weakness in its closing. Gained by 80 points mid day but closed 59 points down in the end. This movement indicates confidence is not there. It is advisable to stay in the sidelines unless the confidence is seen or when this fiscal cliff issue has some positive progress. Just be more cautious in selecting the right stocks. Not all stocks have been going down hard though. Something that I have emphasized again and again. If you want to look for stocks, look for those that have done well in earnings. You would know it by looking at the direction on earnings day. In Singapore Ezion has been running to a high of $1.5, against all odds. The reason is bcos of strong earnings. This is the first company that reached our profit target in our list of recommendations last month. Ausgroup and China Minzhong has fallen a few cents while First Resources and Yoma has been at around the same price since we last posted. With the big caps tumbling (like Semp Marine and Semp Corp or Keppel Corp), I think these companies are slightly a bit more resistant. The thing is now I don't recommend you to enter any of the stocks when the trend is down now. Just wait for the market to turn bullish again, and we study the stocks again. Not a good sign last friday that our market sentiment indicator for NYSE and Nasdaq stock exchange stocks has turned bearish. We would advise being careful opening up any bullish position from now on. 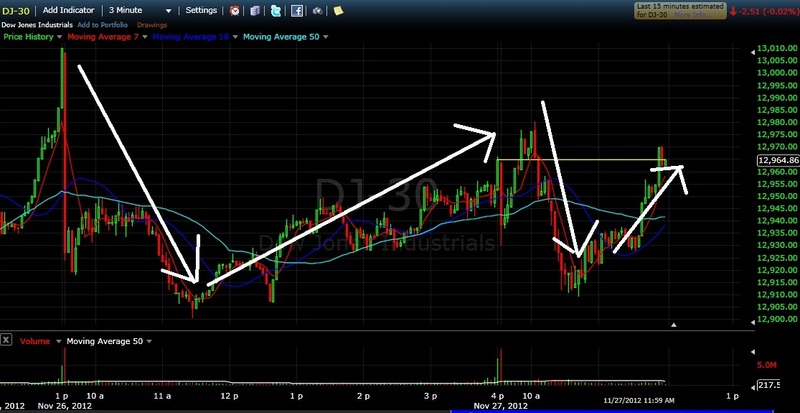 Even if u want to do it, go in with small lot size unless it turns bullish again. And now that the Dow is still below the 200day MA, it is technically not good to be bullish. I am waiting and watching earnestly for this last 50 days towards end of the year, for whatever progress the congress might make. Did u see on Friday the action from Wallstreet. Just before Obama speaks the market is up. After his speech, Dow gave nearly back all its gains. This is an act of "expectation" again. Wallstreet is expecting him to make some positive comments. And in the event he did not make comments up to what the street wants, it is time to profit take, and close position over the weekend! It seems an episode of QE3 once again. Remember in the 2nd quarter, whenever Ben Bernanke speaks, market will run up because they expect him to announce QE3. But whenever he doesn't, the maket sells down. Before the next appearance again, market runs up because of expectation again. I would think probably this 50 days it might be that kinda way things work our again. Expectation and disappointment and maybe expectation again. We might be in for a roller coaster ride until some consensus really come out. Now we suggest be alert to anything that happens to congress on any information. In fact, what we think is this recent drop is a good chance for u to benefit! We still consistently believe that the republicans and democrats will come up with a plan to solve things. Last Friday I was honored to be interviewed by radio station FM95.8 Di Cong and was asked about the technical analysis of US market. From now onwards, I would probably appear on Friday 1.15pm every 2 weeks to give my latest news and strategies on the market. 1) Wait for Dow Jones to come back and stand above the 200 day MA again. 200 day MA represents the confidence of the market. Without it standing above that, professional money may not come in yet. 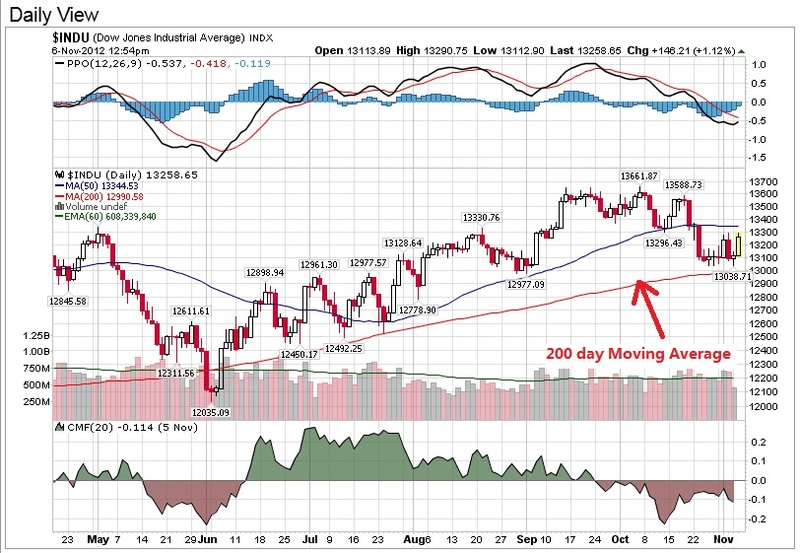 2) Wait for Dow 10 day MA to turn up. The direction of 10 day MA represents the short term direction of the market. It needs to turn up. Apart from the charts, please take note of any latest meetings and news from congress. And during this time, please do your research and pick out all the stocks that did well for earnings this season. 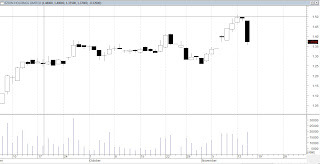 Did u see the run-up of Ezion after their earnings release on 6 Nov? Did u see the strength of our 3 local banks after DBS good earnings on 1 Nov? Did u see Kep Corp collapse? Did u know that their Oct earnings is bad? That is the main reason for the selldown of this stock! Please note that market although is bad, you can still find gems by focusing on their performance after their earnings release. These companies will be the companies to watch this quarter. They will be the strongest stocks once the market condition turns better. This is really what market is about. A new episode of fiscal cliff drama cropped up to replace that of euro crisis. I would like to point out to something that always governs the market. We probably need to Buy Low Sell High to make $. As I have been conducting a few investment classes every week, the first question I always try to find out is how many people have bought stocks this few months. To my amazement, an average of less than 1/3 of the class bought stocks in the last quarter from June to September, where the DOW went from 12000 points to 13660. That means something. Most of us have not been in the market yet. For those that have not been in the market, this provides a good opportunity again. This fiscal cliff episode will again end in a consensus or peace. America will find its way out. They got 53 days left to do something. 1) During George Bush era, he implemented some tax cuts to stimulate the economy. And this tax cuts will expire end of this year which means if congress/ government does not do something to extend this cuts, the tax would be raised automatically. 2) Last year in the debt ceiling issue, a consensus was made to raise the debt, but government spending would be cut. The date where the cut would kick in is end of this year too. If the spending cuts do take place and government does not remove the cuts, quite a few people would be out of jobs. 3) Both this issues dateline are at the end of the year 2012. If these 2 issues are not resolved, Wallstreet thinks that it will lead to a sudden halt in the economy as consumers would probably not spend with higher taxes and less jobs. 4) This problem can actually be solved if government lengthen the tax cuts and remove the government spending cut. BUT the problem with America is that it is too democratic! The US Democrats and the Republicans are as bad as Taiwan! My view is that, yes there may be some volatility in Wallstreet now concerned about this problem. But to those that have not entered the market, this is a wonderful chance for you to buy stocks at a DISCOUNT. This issue does not seem that tough to resolve. This isn't a EURO Crisis or a Subprime mortgage issue where trillions of dollars are involved and companies earnings are seriously in jeopardy. This issue is not something that is so sudden that catch enterprises off guard! A real crisis only occurs when it is caught off guard. The enterprises and businesses in America has already prepared itself for the fiscal cliff. JP Morgan and Visa CEO told us they already did something. The impact seriously is minimal because of the preparation! 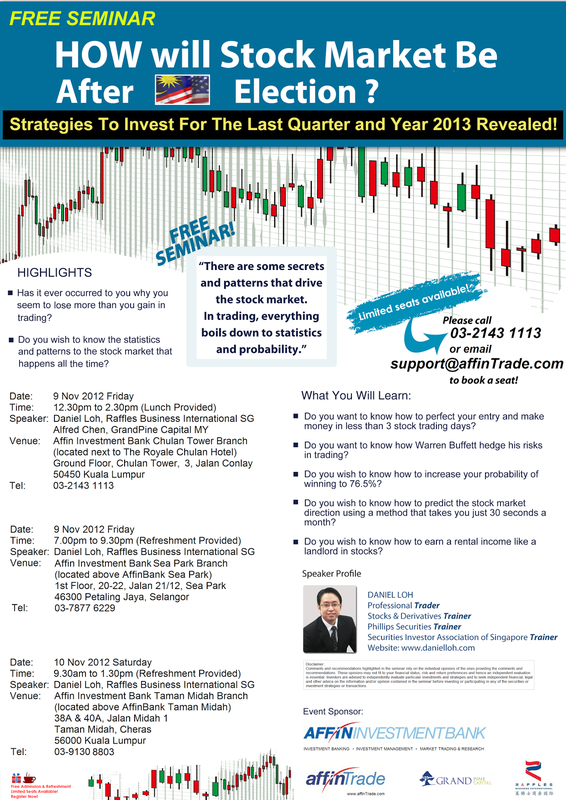 Like what Investment Guru Hu Li Yang said, "Take this as a terrific opportunity to jump into the bus full of people. Everyone wants to be on the bus making money. Nobody wants to alight when times are good. With this uncertainty, some will alight in a panic. GET in when they courteously give up the seat to you." I am sure, at the end of the day, US congress will come up with a consensus, just like last year debt ceiling issue. And when the time comes and the good news released, a lot of us will have no chance to get on the bus again! You may not want to go in now, but try to monitor the progress of the congress, and take note of the dates they are going to release any news. Should u panic after a 300 points drop in US post election? Ouch! a 300 point drop? That is one big drop after the election. Guess Wall Street certainly hates Obama, ha. But one thing for sure, the people still likes him. Of course, the major reason that CNBC gives is FISCAL CLIFF. Well, I guess 2moro papers and media will start to discuss this topic again and again just like the Euro crisis episode. This is the new IN-THING of Wallstreet. The thing is I know some friends might panic amid the drop in Wallstreet. If you have stocks now, that is the last thing you want to do - Sell into a panic. In fact mid term wise, I think this is a good chance to start locating some value stocks that did well for their earnings. Why do I think so? Because Fiscal Cliff has no direct & immediate impact on the earnings of companies. Some of you may argue about decrease consumer spending which will lead to lower bottomline for earnings. Yes, but in the event it happens, companies will also lower their forecast or guidance for them to hit their sales targets. And this isn't the first time that a country raise taxes. Not in America. Bill Clinton raise taxes too in his campaign. Did it cause a sudden collapse in Great America? No, he carry on to lead one of the best thriving economy in American history. One that has no deficit. What really drives a stock price is earnings, the core fundamental of capitalism. Fiscal cliff is a drama played out by two political parties. I seriously do not think they will jeopadise US economy by not compromising. Maybe disagreement, but in the end, everyone compromise for the better America, wouldn't they? A good chance to accumulate good earnings stocks 2-3 months down the road? That is still what I think... by the way, accumulation means buying a little gradually up to elaborate. Bank of America has dropped to $9.38 now since I said it reach a double top a couple of days back! Isn't it a better time to buy if it drops to $9? Mr Warren Buffett thinks financial sector will be on the way up for years to come when economy becomes better, shouldn't we celebrate this drop and get on the boat like him? TOPIC: HOW will the STOCK MARKET be after US election and China parliament change? For more info, pls click on brochure below. Amusing where some polling took place... ha! We know that there are some retailers who have grown frustrated about the recent consolidation in the market, especially since QE3. QE3 did not seem to help the stock market. We know that people are calling shorts now, thinking that Dow Jones might plunge another 1000 points, STI another 100 points or KLCI another 50 points. Our view is that you might not see that drop in the next 2 months, in the mid term. In fact, we encourage you to accumulate stocks now, going into the festive holiday christmas season. With the earnings on the way, pick up those stocks that have done well in the earnings. Not those that fared poorly. Isn't this a good time to buy your stocks at a discounted rate? Well, not many people in Wall Street are supporting our bullishness amid the fall now. We may be wrong, but how much less than 13000 can Dow Jones go? Some of you may have heard of the fiscal cliff. Some of you may have feared about fiscal cliff that is going to happen at the end of the year in US. Especially Wall street! Everyone has been talking about it. Businesses has been preparing themselves for the increase in taxes. All Fortune 500 companies interviewed seemed to have been prepared. The funny thing about this market is that if you are prepared for the worst scenario, the worst scenario normally would not happen. Remember the Y2K bug when people are scared and say at the turn of the century that every single computers or businesses might be frozen? It is because of the fear and the preparation that nothing happens. If you want to know what is Fiscal cliff, take a look at this article. In it, there is an explanation of the fiscal cliff. In short, people are scared of a) the raise in taxes for citizens and businesses and b) the cut in government spending which might lead to job cuts. Both might lead to slower spending and eventually a poor economy, as what Wall Street predicted. 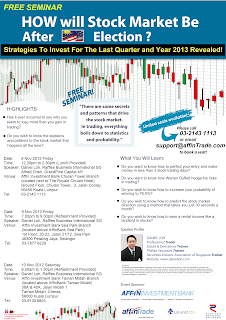 As some of you might know, I have been a proponent of Asian Leading Investment Guru Mr Hu Li Yang's teachings. Mr Hu Li Yang always believe that this BULL RUN will carry on only when there is uncertainty in the market. It is the Euro Crisis that make this bull market survive and continue to run to a high. If everything is well and economy is great, this bull run will be short lived. Please bear in mind that we are 3.5 years into the bull run now. If not for the Euro crisis last year, US and Europe might already be at the final phase of the bull run celebrating a great economy, a great housing market, a low unemployment rate and a rising interest rate. Embrace this FISCAL CLIFF. With the uncertainty, this bull run is still intact and that is the main reason that why we think this bull run can still run on for another 2-3 years. Please bear in mind that BEAR market normally comes when interest rate is at a high, not when it is kept at 0%. - What are the stocks to look at after US election? There have been friends that ask me about buying a stock for the long term. If you want to know my preference, this is definitely one stock you want to invest and keep for at least 3 years, just like Warren Buffett. I have been talking about this stock ever since it was $5. Now it has doubled, to $10, and I believe that it can still double its value. With America's fundamental economy and GDP getting better, financial sector is on the way to recovery. With housing in America also getting better, this is one stock to watch out for! Banking sector is coming back slowly, but surely! Temporarily, it has hit a double top at $10 last week. 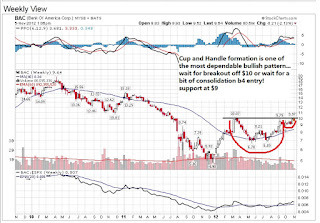 For short term players, wait for a breakout of $10 or a retracement back to $9. For long term players, just get in and wait for 3 years! Bank of America has a dividend of $0.01 every quarter. Another company that did well in earnings this season is Citigroup, which like BAC, is one company you can buy and hold. But comparing, I think BAC has more room to run as dollar value is smaller. For Singaporeans and Malaysians, you may invest in American companies through local brokerage houses too, like Phillip Securities and Affin Investment Bank.